There was an old Jewish tradition of taking a child of less than five years of age to the Temple, and dedicating the child's service to God. The child would be put in the care of a priest, who then offered it to God, and sometimes the child remained in the Temple to receive its education and to be trained to serve the Temple and its Ministers by making vestments and ornaments and assisting in various ways at the Temple services. Tradition tells us that Our Lady's parents, Joachim and Anne, delivered Mary to the Temple at age three, in keeping with this custom. The family of Joachim and Anne and three-year-old Mary set out from Nazareth for Jerusalem, where Mary was to be presented to God in the Temple. 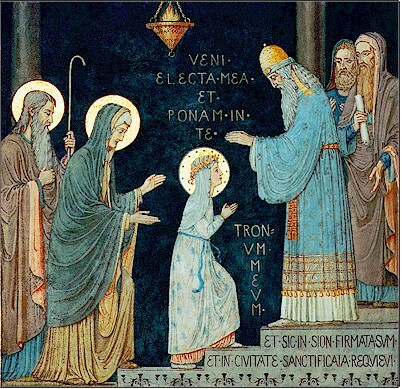 On entering the holy Temple, all three, hand in hand, offered a devout and fervent prayer to the Lord - Joachim and Anne offering up their treasure - their only daughter, and Mary likewise offering herself up. The priest who received her into the Temple was the prophet Simeon, whom she would meet again some 12 years later when she presented to him Our Lord and Saviour, her only Son, Jesus Christ. Simeon handed her over to the teachers, one of whom was the prophetess Anne, who would also be mysteriously present at the Temple for the Presentation of Jesus. With tenderest tears Mary's parents turned and left her, as she ascended the 15 stairs to her new quarters, while Mary did not feel the slightest remorse or sorrow at leaving her parents, but rather a feeling of serene peace and happiness, which the Most High granted her to console her in her new surroundings.